One of the major surprises of the recent European Track Championships was the sudden exit in the match sprint 1/16 finals of reigning triple Olympic champion and fastest qualifier, Sir Chris Hoy at the hands of what was described as an 'unknown' Irishman. Felix English has grown up in England but is the son of Irish parents. He declared for Ireland and is part of the recently-reduced Irish male track team aiming to qualify for the London Olympics. He normally wouldn’t concentrate on the sprint, being more of an endurance rider, but with just one slot available for the Omnium events his team-mate Martyn Irvine competed in those races. That put Hoy into the sprint race and he came up against Hoy in the first round. Hoy jumped hard and, as might be expected, got a strong lead. However he underestimated his rival, who was able to continue his drive to the line and overhaul the decelerating Scot. And while English didn’t progress past the next round, he nevertheless picked up some experience and, equally importantly, some good memories. Still just 18 years of age, he is expected to keep improving as he ages. He has shown some strong talent and could turn out to be an important name for the future; VeloNation tracked him down to get the low-down on his headline-grabbing ride. VeloNation: How old are you and where are you from, Felix ? Felix English: I recently turned 18 and I am from Brighton, England. VN: 'English' - not a good name for an Irishman ! Where did that come from ? FE: Yeah, I get that a lot - It's a translation from an old Irish name. Don't ask me to pronounce it, or spell it, though! VN: How did you get into cycling? FE: My Dad was a good cyclist when he was my age (he represented Ireland at the junior world road championships) and he wanted to get back into the sport. That was when I took an interest and started racing, back in 2004. VN: I've read that you're really a road man - why ride the sprint in Poland? FE: I am now part of the Irish Elite Senior Track Team, which has been trimmed down to two riders; Martyn Irvine and myself. Martyn is riding really well, he's riding the omnium for us. We are both training for the omnium, but only one rider can do it. So I used Poland to gain experience and to practice my flying lap! VN: What are your best results until now, both on road and track ? FE: This year on the road I won two stages of the Junior Tour of Ireland and the KOM competition. I was second in the prologue and won the final stage in the Junior Tour of Wales. On the track I have five British National Track Championship Medals. 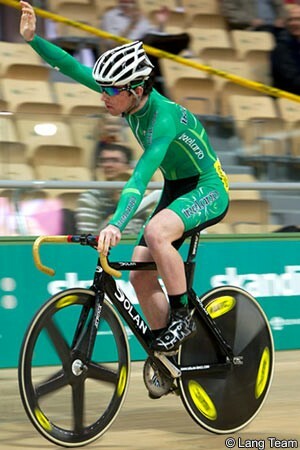 More recently, representing Ireland at the European Track Championships and beating Sir Chris is important! VN: Were you at Delhi [Commonwealth Games]? VN: So, you knocked Chris Hoy out of the sprint at the European Championships. Can you tell us about the moment you beat the reigning triple Olympic champion? FE: It was surreal. I am still surprised it actually happened! Sir Chris is the kind of rider who doesn't make mistakes, and for him to make one whilst racing with me is just unbelievable. He hit me from the top of the track with 300m to go and immediately got a good gap. He then started cruising along the back straight and drifting up the track. The gap was slowly coming back but then around the last bend I came at him fast and hit him with 50m to go. The first he knew of it was when I was on his shoulder going 10km/h fast than him! VN: Did you talk to Sir Chris after you had eliminated him ? FE: Yes, he was still very friendly and congratulated me. VN: Have the Irish media made a fuss of you? FE: I don't think too big a fuss was made; I made a few of the national papers, though! VN: What shape is Irish track sport in? FE: With the small budget I think we're coping quite well. However, a lot of money is being wasted in silly places, so there's still room for improvement. The men's track team has been trimmed down to just two riders, and we are now working with our new coach Andy Sparks, who has already brought us both on massively. VN: Isn't it difficult with no indoor track ? FE: It's not ideal, but we train at the UCI centre in Switzerland. But everything is just really expensive out there! VN: Where now - what are your goals, and will you be going to the track Worlds ? FE: I head back to the UCI Centre in Aigle, Switzerland on the 1st December. I will be training there and then heading to Cali, Colombia for my first World Cup. VN: Who impressed you most at the Europeans ? 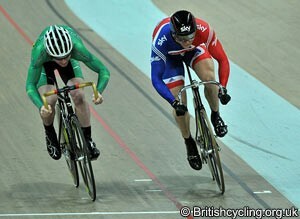 FE: I have to say my team mate Martyn Irvine, who rode in the men's omnium. It was his first time bunch racing in a major competition and he was clearly one of, if not the strongest, rider in the race. He'll be one to keep an eye on over the winter. VN: Do you think Sir Chris will 'sit up' the next time he meets you in a sprint? FE: Definitely not. There is a good chance I could meet him in a first round sprint again. I will most likely be riding the sprints again in Colombia. If we do race again, I'll be given a kicking…!